Great news! 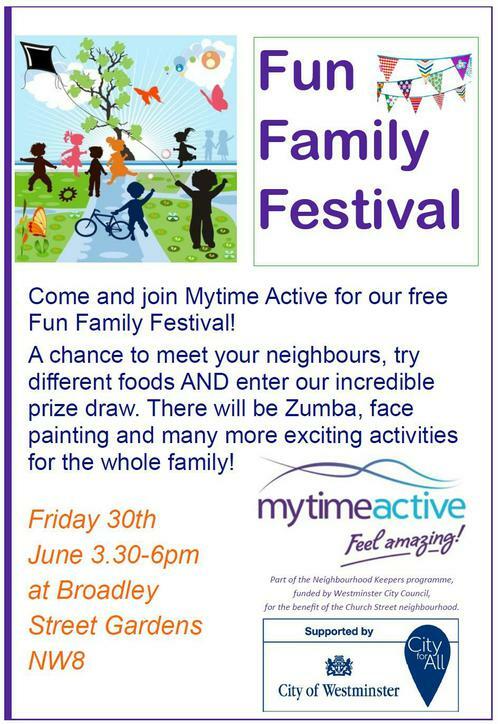 Mytime Active will be putting on a Free Family Fun Day after school on Friday 30 June from 3.30-6pm at Broadley Street Gardens, NW8. The Family Fun Day is part of the Neighbourhood Keepers Programme and funded by Westminster City Council. The Family Fun Day will be a chance to meet your neighbours, try different foods AND enter our incredible prize draw. There will be Zumba, face painting and many more exciting activities for the whole family! If you work with families in the Church Street area please share the attached poster, or display it in your venue and encourage everyone to come along and join us!